We’d like to cordially introduce you to Monti Blu. 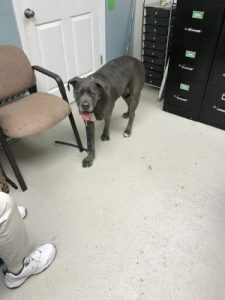 Monti here is a rescue mastiff that is nearly 100 pounds of straight loving. Monti started having seizures this year in addition to having horribly infected ears and a scratchy coat with a huge hunch in his back. In other words, Monti was a mess. His mom and dad wanted Monti to have every chance at a great life, and since he’s only four, they figured better start now! Monti’s first visit occurred the morning after he had multiple seizures in a row the day before. He had been on a cocktail of medications but none had seemed to help and most just left him exhausted and lethargic, yet restless to the point where he couldn’t sleep. The seizures started out of nowhere this past year and couldn’t be link to any one specific event, which is why we thought there may be a structural component to why they were happening. (Check out our blogs on seizures for more information on how structure can alter brain conductivity!) He had struggled with ear issues for some time and also a very scratchy, dandruff filled coat. We started seeing Monti Blu every other week for the first two months, and during that time frame he didn’t have a single seizure. He began to sleep soundly for the first time in months and he had more energy than he had ever had previously. Carefully, we began to spread Monti’s adjustments out to see if he would hold. During the next four months, Monti only had two seizures and they were quite mild compared to before. He came out of them quickly and seemed to normalize without much trouble. During this time his ears also began to clear and thanks to the addition of coconut and fish oil, Monti’s coat no longer had any dry skin. In a matter of four months, Monti’s entire life changed just because his parents trusted chiropractic to help, and it did! We love Mr. Monti Blu and look forward to helping him age gracefully and hopefully near seizure-free!